Northamptonshire Council run a bus pass scheme which allows residents who hold a bus pass to be entitled to free bus travel throughout Northamptonshire between 9.30am and 11pm, Mondays to Fridays and free travel all day Saturdays, Sundays and bank holidays. Additionally, the pass is eligible for use anywhere in England but the times of use may vary in other counties. Persons born before 5th April 1950 or are in receipt of a state pension. Persons who are blind or partially blind. Persons who are profoundly or severely deaf. Persons with a disability or persons who have suffered an injury which has had a sustained or long term effect on their ability to walk. Persons without arms or have long term loss of the use of both arms. Persons who have learning disability that causes significant impairment of intelligence and social functioning. Persons who have been refused a driving licence or whose licences have been revoked on medical grounds. 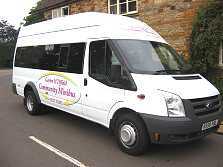 Bus passes may be obtained from any Northamptonshire library. You will need to take relevant proof of age or disability, and proof of residence (see below). Other relevant documentation (e.g. evidence of being Registered Blind). Please note that medical evidence may be required in some cases. Bank Statement or Household Bill no more than 3 months old. Bus Passes are renewable on a five yearly basis.